A car caught on fire on top of the Alwarpet Bridge at around 9 pm on Saturday. 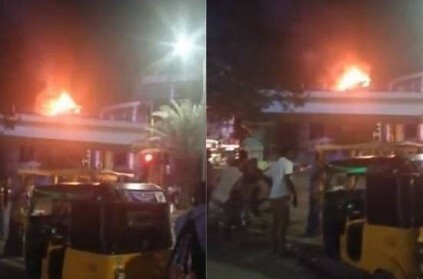 Disturbing visuals of the fire raging on the bridge opposite Cauvery Hospital was shared by Singer Chinmayi on Twitter. A girl could be heard talking in the video explaining the situation at Alwarpet. According to the girl, the fire had been going on for more than 10 minutes but nobody tried to do anything to stop it. From the video, heavy traffic could be witnessed on the bridge. The girl states that she could not reach the traffic police. She then requests for the police to come and take necessary measures. Commenting on the video shared by Chinmayi, Additional Commissioner of Police (Traffic) Arun ascertained that he has sent his team to the spot. They are reportedly attending to the dire situation at Alwarpet. This page contains news relating to various facts and events. The views are generally about current affiars and general topics in diversified areas such as political, international, national, and regional issues, sports, health, travel, lifestyle, technology and business. People having similar interets on the above topics will find this page useful. Car catches fire on Alwarpet Bridge - Shocking visuals out | Tamil Nadu News.